The first time we played The Food Game my son ate a whole serving of Broccoli. I was blown away! I wish this game was out when my teens were younger. What a difference it's made in the diet of our two younger ones! Included in the instruction and tip booklet, 12 meal plans / recipes designed specifically for The Food Game by the author of The Healing Power Of Whole Foods, Beth Loiselle. Visit Beth´s website from our Links Page. Mealtime, a time when a family can sit together and not only interact, but also enjoy a healthy meal together, has declined according to many studies. 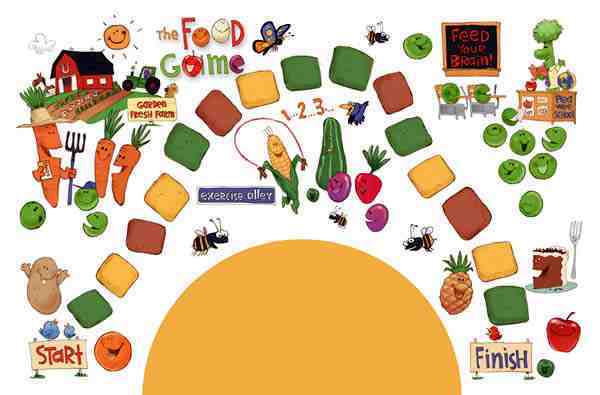 The main objective of The Food Game is to instill healthy and balanced eating habits in children at an early age. However, The Food Game is also designed to promote quality family time through interaction at the dinner table. Enjoy the food, enjoy the family time, and enjoy THE FOOD GAME!